What is better than spending a warm summers evening enjoy drinks with friends around a cozy fire pit? Or how about cool autumn nights with the family spent huddled up around the fire pit roasting marshmallows? When it comes to fire pit kits, choosing the right color tone, texture, and shape to match your home can be a fun and exciting process. If this sort of home improvement project is on your radar, then check out some of our favorite fire pit kits below. 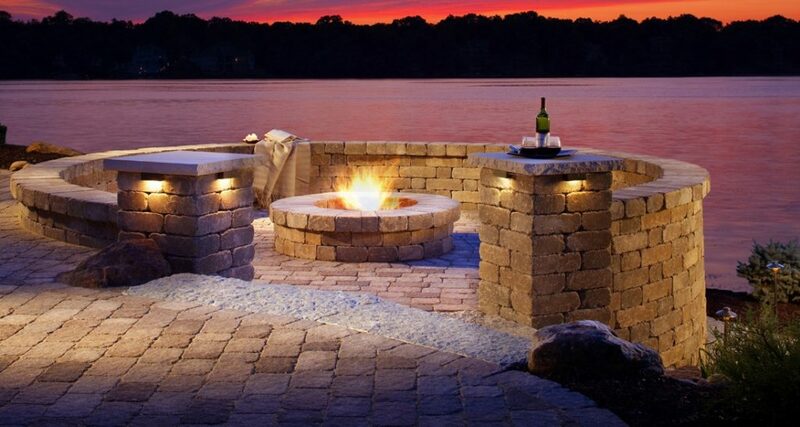 Add warmth and opulence to your outdoor space with the Unilock’s Sunset Fire Kit. These paving stones have a very trendy marble like finish which can compliment any outdoor space. The Unilock Sunset Fire Kit comes in three different colors, of Limestone, Almond Grove, and Sierra. These three colors have very different shades, which means that you can choose which shade will match your patio furniture best. The colors can also be selected to match the paving or brick structure of any home. The fire pit kit uses the Brussels Dimensional System, which can be constructed into a round or square fire pit. The Brussels Dimensional System means that the stones are versatile enough for any space, due to the multi sized, tapered components. 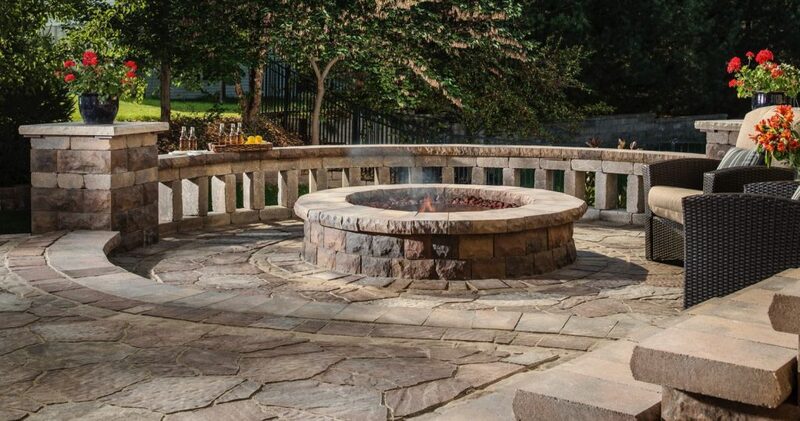 Even though the inserts are sold separately, the stones are priced well and with detailed dimensions available, it makes it easy to plan the location of the fire pit in any outdoor space. Finding the right fire pit kit for your home can be a challenging task when there are so many options available. Belgard’s Weston Stone Fire Pit Kit adds the perfect modern touch to any outdoor area. You can find the fire pit stones in a variety of different tones, to match the sophisticated and contemporary look of any modern home. Choose from the various paver styles, like Bella, Toscana and Victorian to create the perfect fire pit, for any kind of social gathering. The chic textured stones can be built in either a circular or square shape, designed to fit in any outdoor patio space. There are 4 different sizing options for the stones, as well as two different matching inserts for the fire grill. The neutral color blends match most Belgard paver stones and create a clean aesthetic look. Add the perfect look and feel to your flourishing garden space with a fire pit kit. 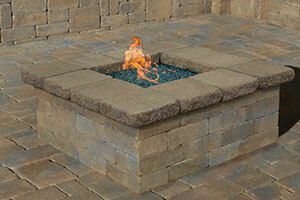 Cambridge Pavers sell a variety of pre packaged fire pit kits. There is a choice between gas and wood pit kits, and each comes with everything needed to build the perfect fire pit. 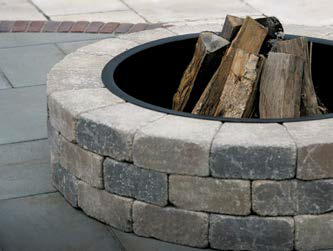 The pre packaged Olde English Square Fire Pit Kit, is made with stunning olde English wall stones. The optional gate means the fire pit can instantly be converted into a barbeque, for ultimate convenience. The Olde English Fire Pit Kit comes with options of toffee or onyx as well as a fire pit spark screen. The second option is the prepackaged Pyzique round barbeque & fire pit kit, which is made using pyzique wallstones and has options available of renaissance or split face. The third option available is the pre packaged Ledgestone roundtable barbeque and fire pit kit, which comes with an optional bluestone blend barbeque and fire pit spark screen. Lastly, the Cambridge barbeque & fire pit cover with galvanized steel cover, ideal for those dealing with a lot of wind and rain. With such an incredible variety of modern and sophisticated fire stones, available in a large range of different color tones, finding the right fire pit kit for your home needn’t be a challenging task, when there are so many options available.